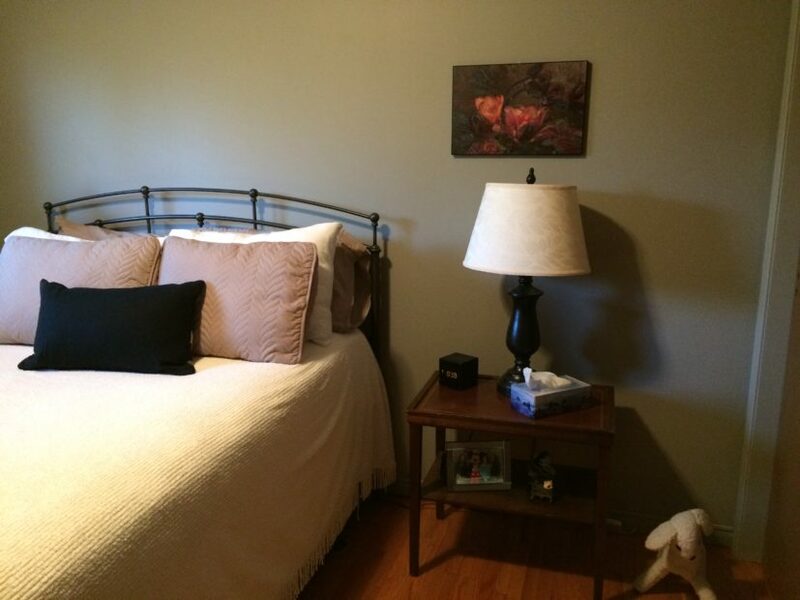 I recently received a question from a reader about her bedroom. Something about the room was bugging her and she thought maybe she should paint. She had already been to the paint store several times to pick up some samples. When she put the new colours on the wall, it wasn’t really giving her the look she wanted. Part of the problem was that she kept picking similar colours because she really did like the wall colour. It was her husband that told her that simply putting a new colour on the wall won’t solve her problem. What she needed to do was to decorate. Here’s the problem…she only likes beige. So her entire home is done in beige. And she doesn’t like clutter or having too many things around. So that leaves her with a home that’s stark, boring and not at all exciting. And just in case you’re thinking she’s a boring person, she’s not. She’s vibrant and funny and not beige at all. Here’s something really interesting, her husband loves colour and texture and pattern. He’s a bit of an artist so this beige boring non-decorated look is killing him. Fortunately it’s not a hard fix. The hardwood floors are gorgeous and the wall colour (PPG Sharkskin 513-5) really blends nicely with the vintage floors. They have some good basic pieces and just need a few touches to elevate the space. 1. Add some colour and pattern with bedding choices. 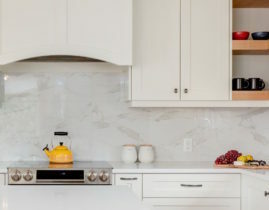 Stark white with pops of colour and texture adds a beautiful contrast. There’s something about crisp white linens that scream luxury. Plaids, stripes and checks are classic patterns that are easy to start with if someone is colour and pattern sensitive. With the Sharkskin wall colour, red is an excellent choice to bring it to life. Red is such a strong colour that you don’t need a lot. I think every room should have a bit of red. 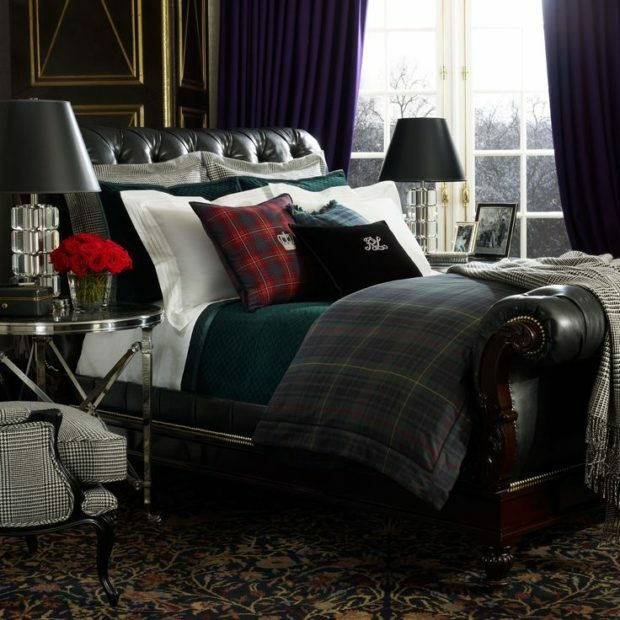 I like the example below with the Ralph Lauren Bedding. It’s gorgeous and colourful and really interesting, yet there isn’t a lot of colour. It’s all about the mix and the textures. Notice that there are two fairly bright toss cushions and a blanket that repeats the red in a subtle way. What there is is texture and pattern and layers. NOTE: Bedding today is all about the layers. 2. An Area Rug is a Must!!!! 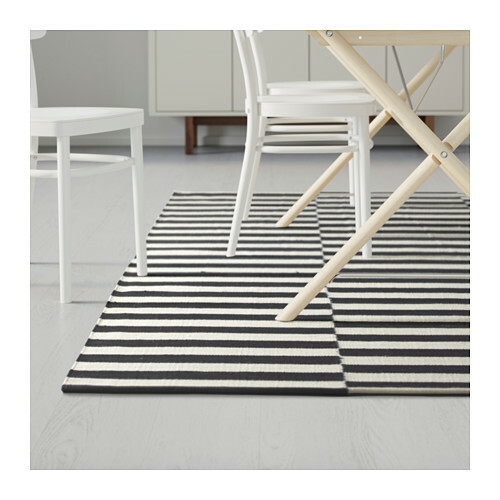 In the picture above, the chosen rug is a black and white stripe. This is a great choice for someone that’s afraid to commit to colour. The black and white stripe packs a strong punch without adding crazy amounts of colour. Ikea does a nice striped rug that’s a good one to start with. I also would suggest a Persian Rug. 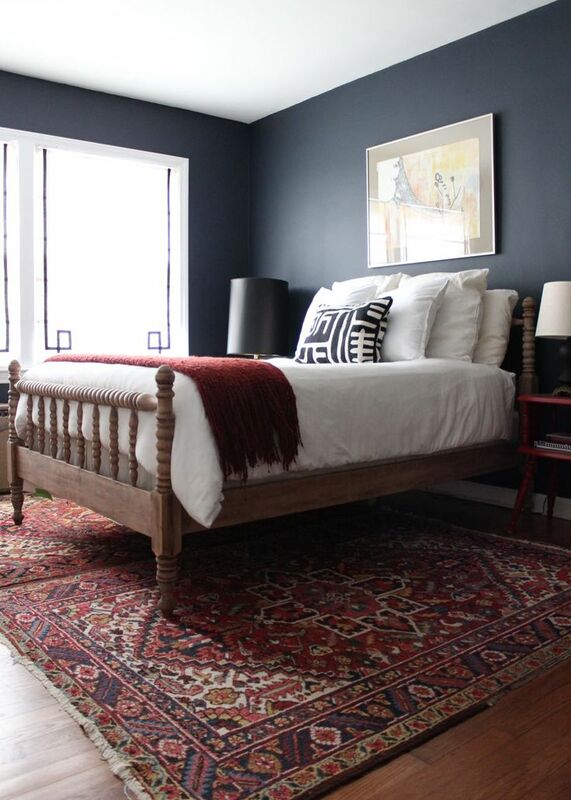 This rug will have more colour, but it’s a classic. 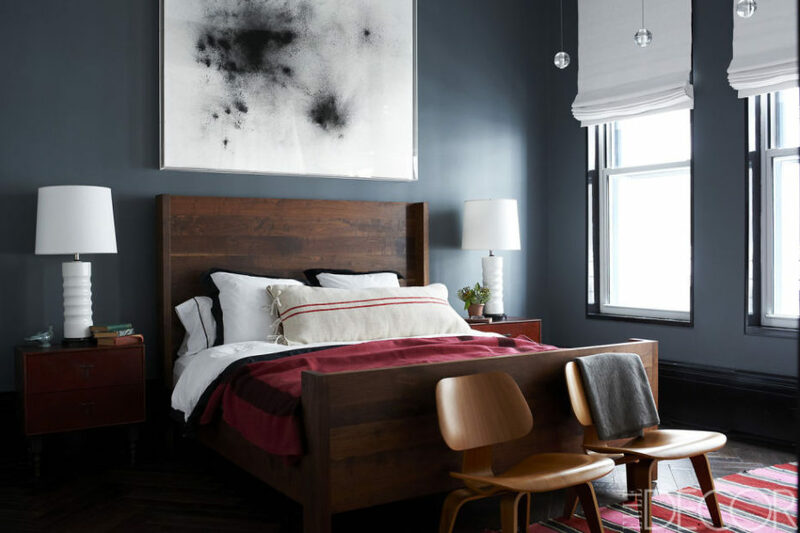 Even though it’s full of colour and texture, it looks at home in a bedroom. This piece might be a bit of an investment, but it’s a forever rug. 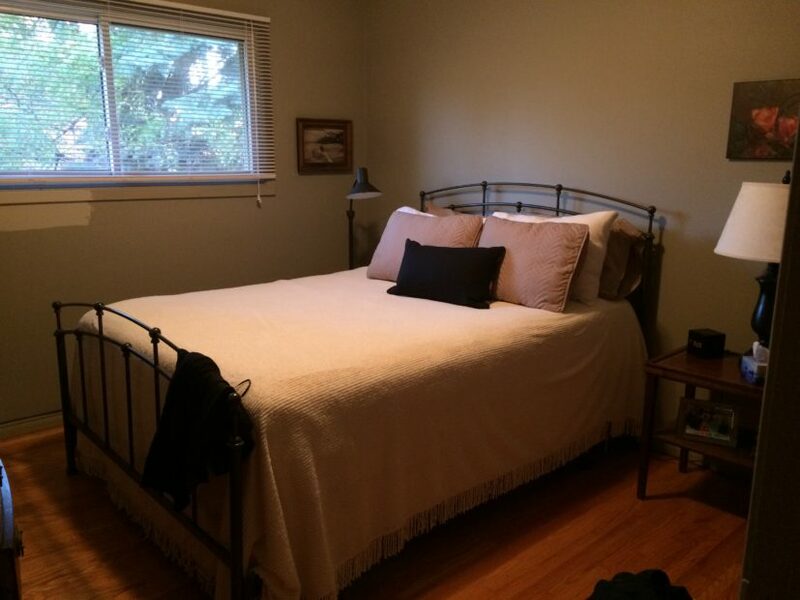 Notice in the photo above that the walls are a strong colour and the bedding is mostly white with a the blanket at the end providing a hit of colour and the toss cushion in a graphic navy and white. CHEATER NOTE: If the budget doesn’t allow for the investment in a Persian Rug, there are some nice knock offs available at Home Sense and even Ikea. Love Love Love these wall sconces. Notice that they aren’t hardwired into the wall so the install does’t involve an electrician. These lights work well in a bedroom because they don’t take up space on the night tables and the light is nicely directed for reading. Yes you’re reading correctly, matching bedside tables. Usually I gag at the thought of a matching set, but like a nice pair of chairs, matching bedside tables have their place. 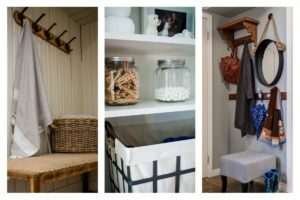 Because this room is on the smaller side, having a matched pair will bring symmetry and order, making this room appear less cluttered and larger. 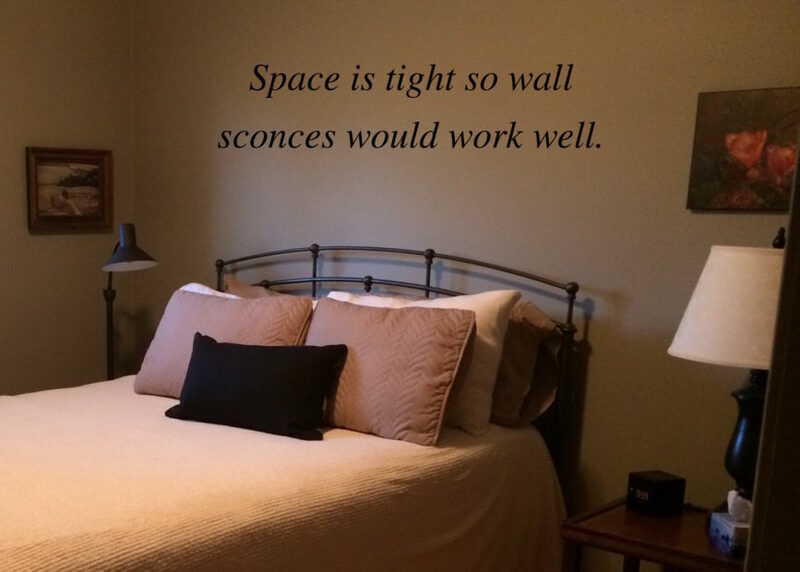 I would also suggest moving the bed closer to the middle of the wall. It looks and feels better when centred. 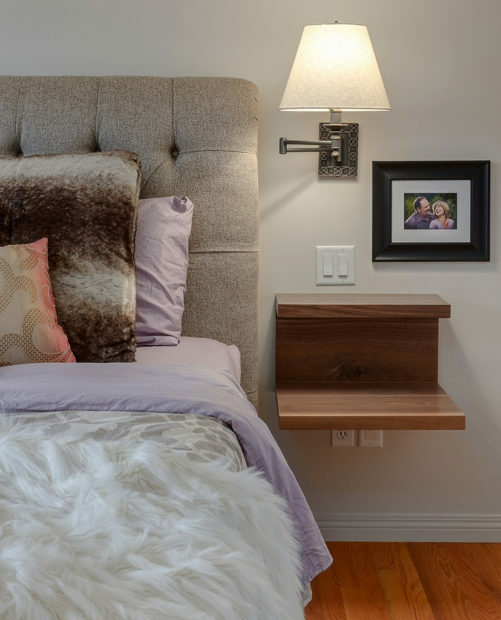 Depending on what is kept in the bedside table, a nice way to create space is to use a shelf. We had this custom made out of walnut for a client. It provides two levels of space for eyeglasses, books and water. The simplicity of the design makes a strong statement, yet it doesn’t take up a lot of room. 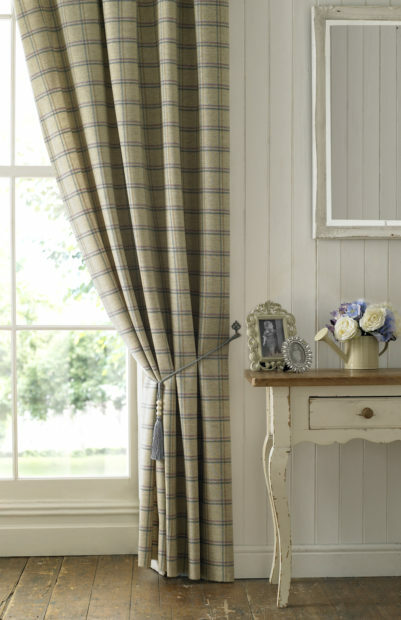 Draperies will frame the window and ground the room. Use a black rod and keep the finials simple. Custom provides a beautiful look, but if that’s not in the budget, there are some beautiful ready mades. I suggest using a tone-on-tone pattern if living with colour is an issue, but a pop of colour would be beautiful. A plaid would be a nice choice as it is an easy pattern to live with. And yes you can have several plaids in one space. 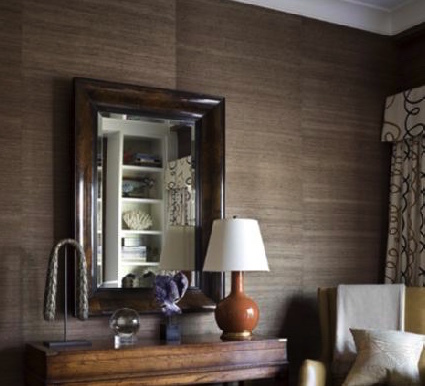 For those that don’t like a lot of stuff, meaning pictures, art and knick-knacks, I like to recommend wallpaper. In this bedroom doing a wallpaper feature on the small wall behind the head board would do a lot to increase the interest in the room. The nice thing about wallpaper is you can get crazy, but you can also do a textured paper. Keep in mind that wallpapers are a lot easier to work with (and remove) then in the past. And in case this is just too much, here’s another picture with a grasscloth that might be easier to live with. If there are cats in the home, then I recommend a vinyl textured paper, as cats love grasscloth. The time has come to purchase a flat screen tv. The far end of the room is too cluttered. I suggest mounting a new (and it can be larger) television over the dresser as it will provide more space in the room. 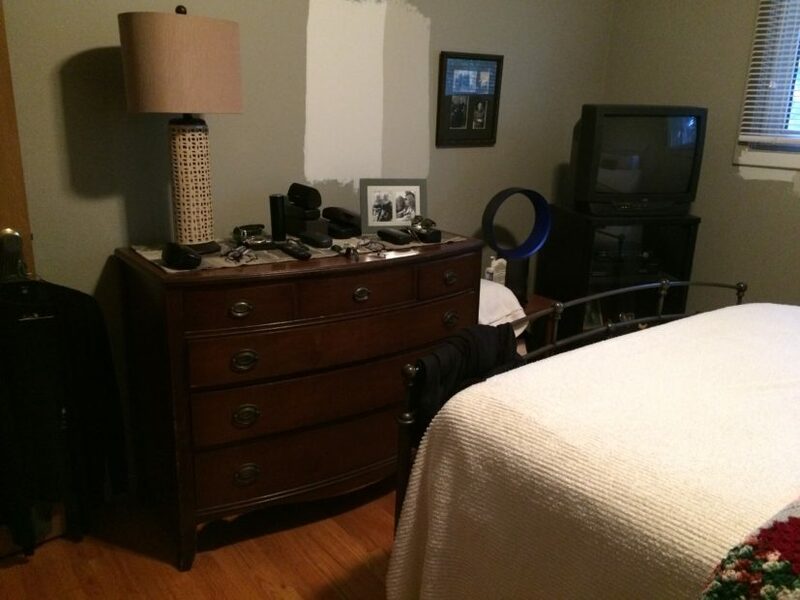 The dresser and television will read as one unit, and if the Dyson fan is a must, then that should be the only other thing on that wall. Place a large tray on the dresser to contain eyeglasses and other stuff. One small decorative item should be on the dresser, maybe a colourful vase or a pretty box. 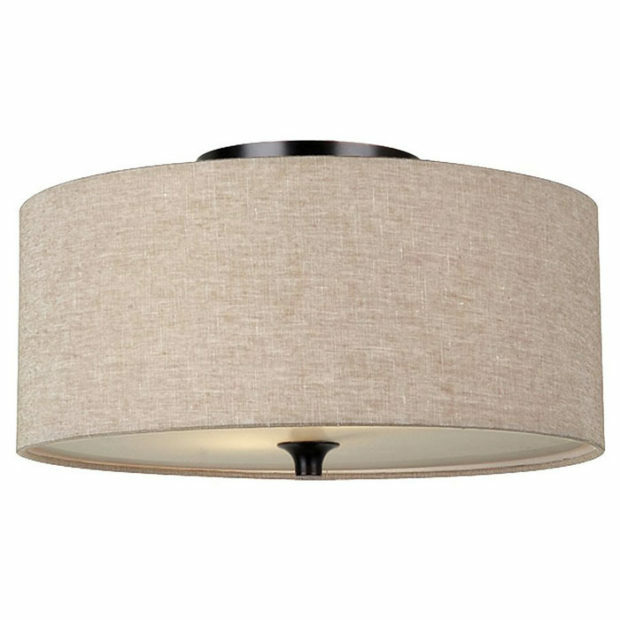 A quick and easy way to update a room is to change the overhead lighting fixtures. 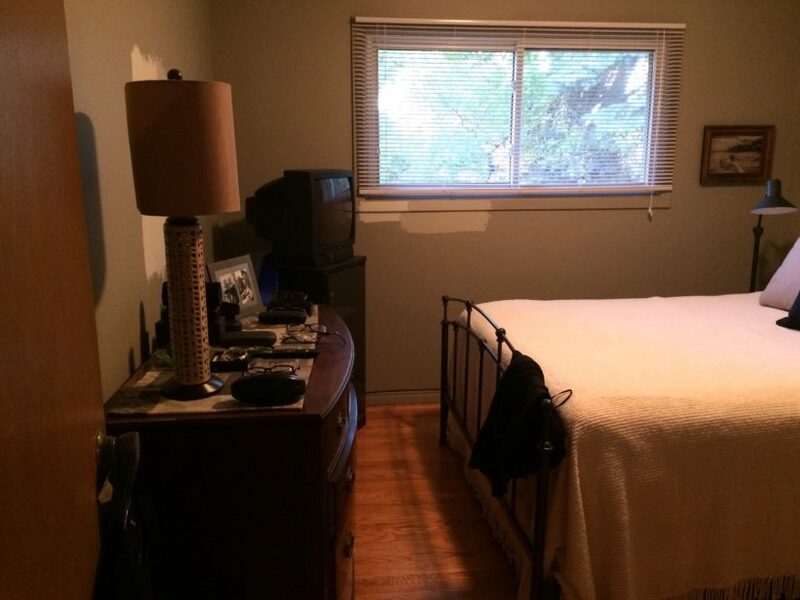 I recommend a simple drum fixture for this room. 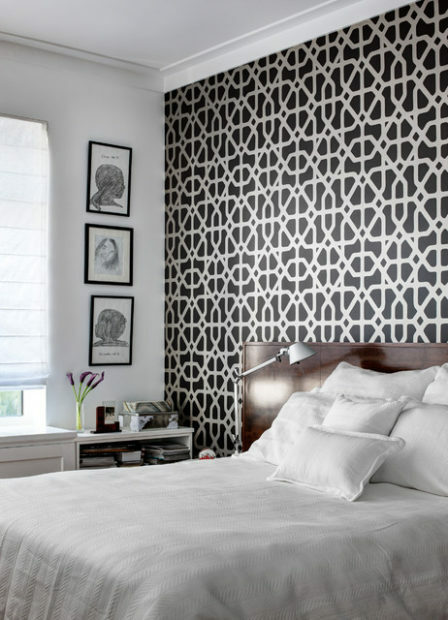 With the wall sconces, draperies, layered bedding, area rug and possibly wallpaper, there’s a lot going on. This is not the place for an elaborate light fixture. 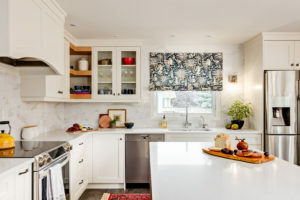 Semi flush is a good option when the ceilings are 8 feet because it doesn’t hang down too far, but still sits off the ceiling. Helpful Hint: Lowes has great lights and they can be ordered on-line. 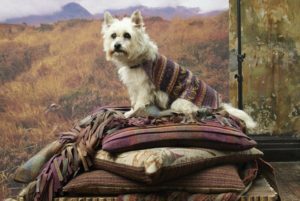 I’ll leave you with one final image from Ralph Lauren. 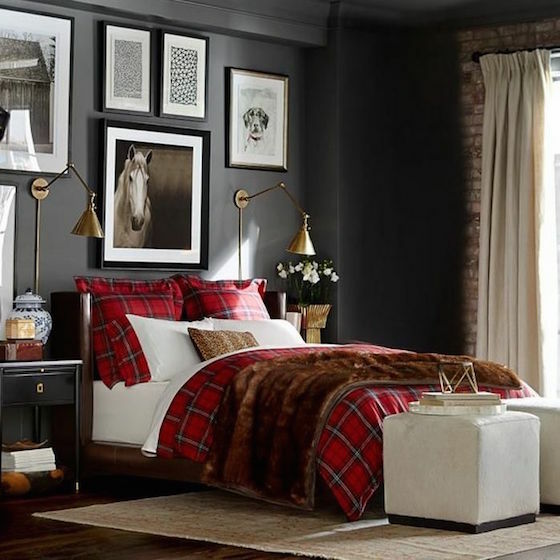 Look at all the prints and colours that are mixed in this bedroom, yet it has a very calm and soothing feel.